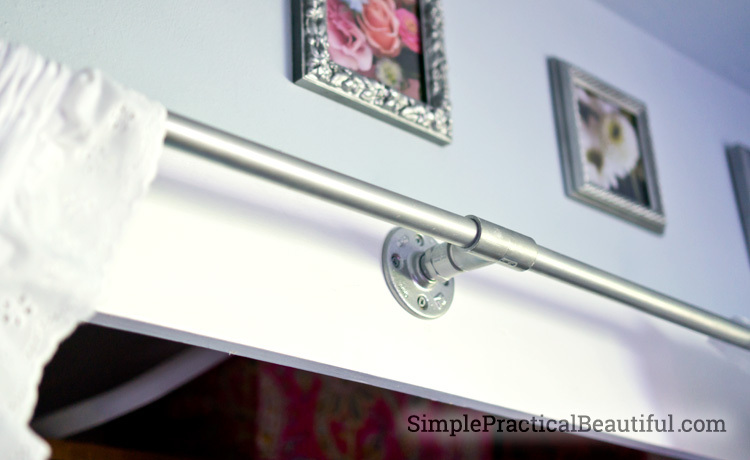 PVC pipes and fitting painted silver make beautiful curtain hardware for these closet curtains. 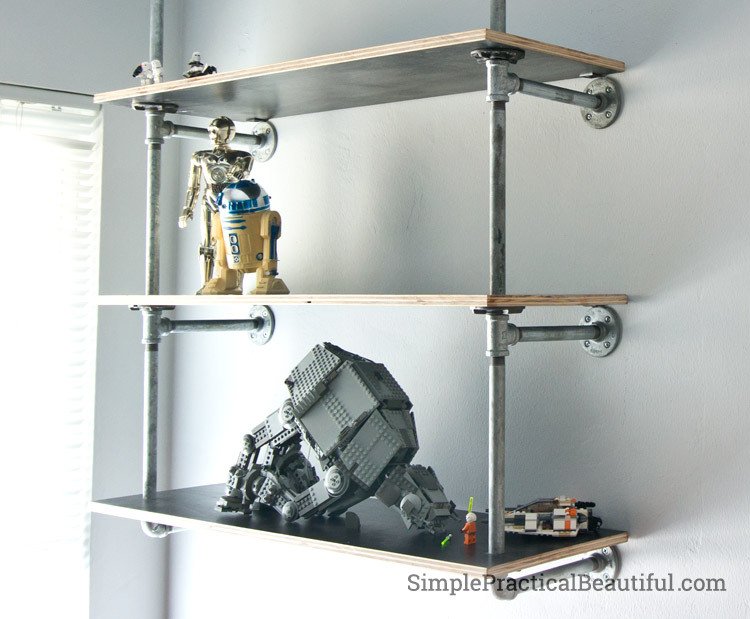 I really like how the industrial pipe shelves in my son’s room look with galvanized steel pipes. I wanted to use that same look in my daughters’ room for their curtain hardware, but paint the pipes so they look a little softer and less industrial. I realized that if I was going to paint the pipes anyway, painted PVC pipe would look as good as painted steel pipes but cost a fraction of the price. So I made the hardware for my daughter’s closet curtains from PVC pipes and fittings. It only cost me a couple of dollars. I used 1/2-inch PVC pipe for the curtain rod. 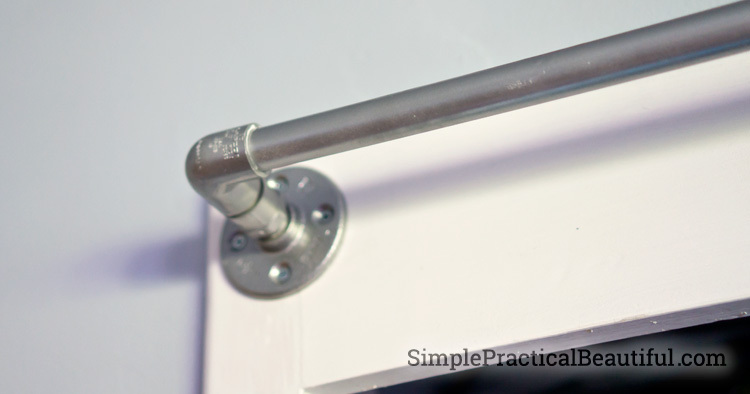 It’s not very sturdy, so I designed the hardware to connect to the wall three times, the two ends and the middle, otherwise the PVC pipe would start to bend and bow under the weight of the curtains. 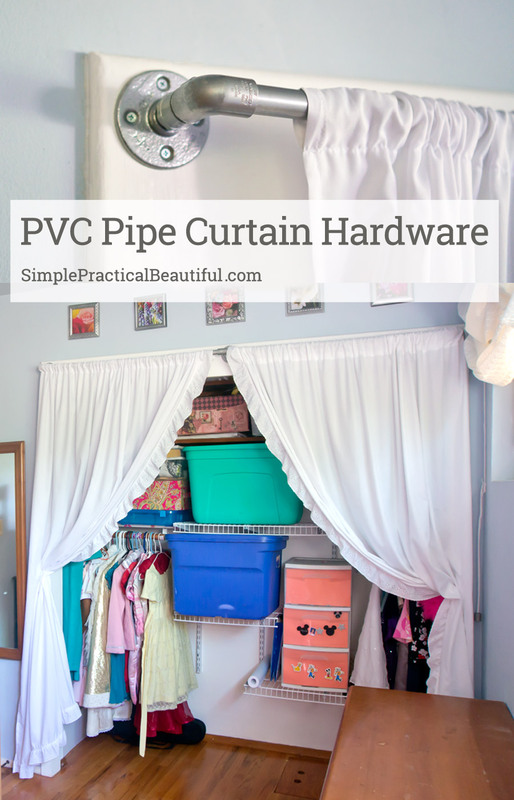 The closet is 6 feet wide, so each length of PVC is only 3 feet. I used floor flanges to connect to the wall. I already had steel floor flanges from a previous project or I would have used cheaper PVC flanges. For fittings, I bought two elbow joints and a T-joint, plus a thread to slip adapter for each. I also cut a few small pieces from the PVC pipe to connect the pieces. I painted everything silver with Rust-Oleum metallic paint. 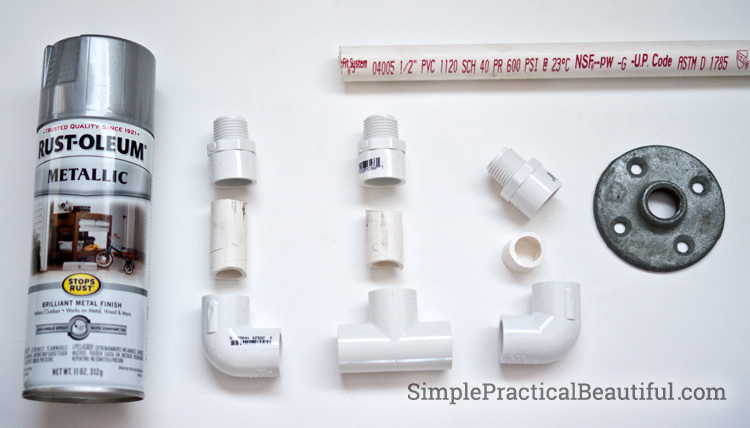 I pushed a short piece of PVC pipe into each joint fitting and pushed the other side of the PVC piece into the slip side of the slip to thread adapter. I used a rubber mallet to hammer the whole thing tightly together. This will screw into a flange and make one end of the curtain rod. I used screws to attach the end flanges on the ends of the closet first. Then I screwed on the end fittings with the elbow joints and pushed the 3-foot PVC pipe into the elbow joint. 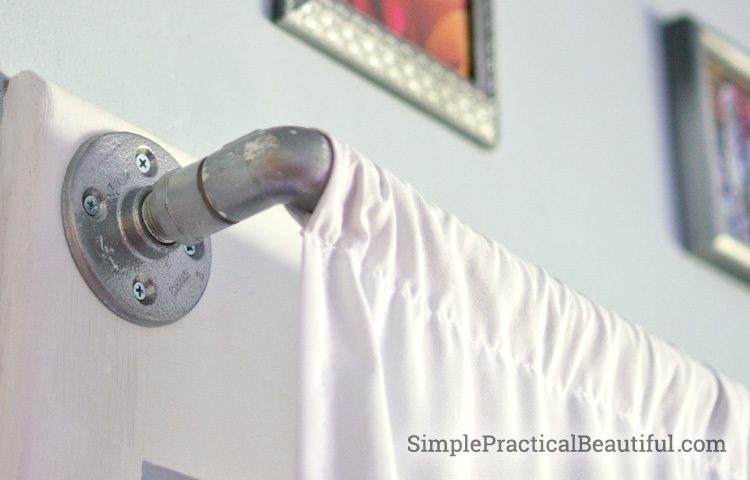 There are a lot of different ways to put the curtain hardware on the wall. I started with the ends first. Whatever way you put them up, you have to put the curtains on before everything is attached, otherwise there will be no way to put on the curtains. I slid the curtain onto the PVC pipe at this point. You’ll notice some of the paint has started to chip off a little from working with the pipe (like, hammering it with a mallet). The scratches will be covered by the curtain. With both sides and both curtains on, I slid the two PVC sides into the T-joint. Okay, “slid” makes it sound easy. I actually did a lot of wiggles and shoving the pipes to get everything in and straight. Then I put on the flange and attached it to the wall with screws. I love how the pipes look as curtain hardware, and the silver color looks perfect with the frames of the flower pictures above the closet. 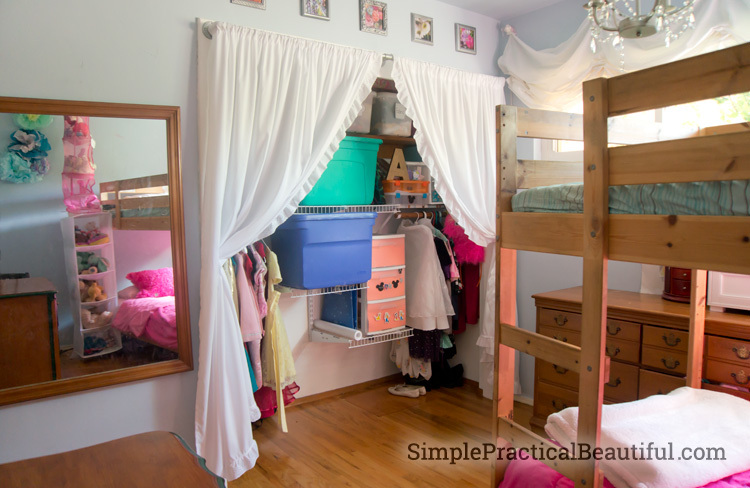 You can see how I made the closet curtains from bed sheets here. And months ago, I posted about reorganizing the closet for my tween daughters. That was really smart thinking Rebecca. I see how much nicer and softer they look with the paint. You want something nice like that for the girls room. I really love the curtains. This is a brilliant idea, Rebecca. Thanks for sharing. I have been wanting this industrial look, but thought it was too expensive. 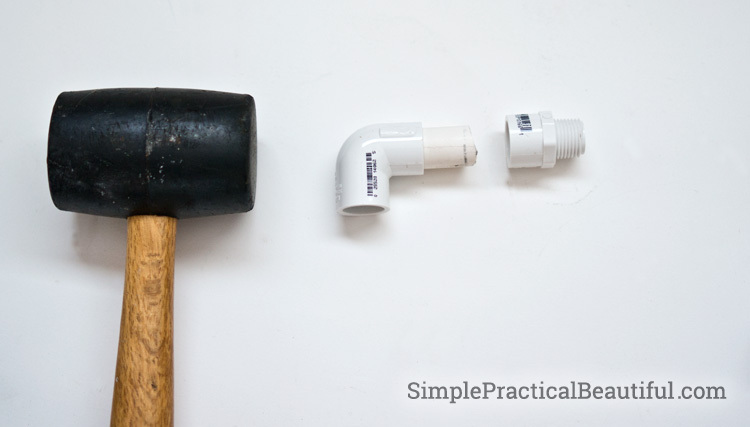 I never thought of using PVC and painting it-brilliant idea!